The chapbooks, lit mags, and zines that Porkbelly Press makes are gorgeous—beautiful cover art, lovely interior and exterior design, well-made bindings, and an overall press presentation that is smart. I love the way that Porkbelly Press, signs, adds art, and a stamp with a press logo the envelopes for the post. Given the vast area of chapbooks out there and the ways in which different presses produce them, why did you decide to create the chapbook press the way that you have? We read our submissions with care, accept only a few pieces or manuscripts each year, and produce limited and small editions. I format and arrange chaps into booklet format, print them, curate (or paint or print) cover imagery, use a bone folder to create nested signatures with sharp edges, sew, trim, and affix finishing touches (sometimes hand-cut title flags or press flags, or decorative end papers). The craft and care given to each book is the best way (for us) to show appreciation to the poet (or author) and to the reader. We’re not the press that’s going to do 5,000 copies, but we are a press that will do our damnedest to make something striking, and to put it into the hands of the reader who needs it most. If you like the covers, just imagine what’s hidden between the pages. Writers and poets often talk about advocating for their work, promoting their work, and supporting the work of other writers by giving back, thereby creating a community where literary endeavors of small presses and the writers they publish is celebrated, discussed, and read. What strategies of advocacy and promotion do you think are most helpful? Of all the methods we’ve tried so far, word of mouth and Twitter seem to work best for us. We use social media platforms to sling promos, excerpts, photos, and FB for process pictures and calls. We re-tweet, reblog, and generally crow a bit whenever we hear of something neat happening for/mentioning one of our poets/writers/artists. We also make mention of interesting articles and calls for submission from other folks. And there may be a few cat and dog photos on our pages, because… because. We use bright colors to lure in the artsy types, enticing them with our covers into the world of micro fictions and sultry poetic verse. More than a few of our instagrams have been loved on by strangers. We’re not ashamed. Ultimately it really is about the community, about supporting each other and helping friends to find the words to light up the important parts of their brains. Keeping the focus on why we love what we’ve selected is our approach. We’re passionate about language & so we say, this is why, and, what do you think? We do our best to open a dialogue and ask questions. We always ask for feedback from our readers. We seek out relationships with distros and brick & mortar shops, tracking down advocates with similar interest, and give them a sample. It all comes back to passion and connection, no matter if the vehicle. Barring FREE PIZZA, we think handcrafted chapbooks are a pretty darn good lure. Alternate answer to this question: Ray Bradbury said, “Find the author who can lead you through the dark.” That. That’s what we’re doing. Wanna hold hands and come along? Porkbelly Press has released seven chapbooks in it’s first year—including Love Letter to Biology 250 by Chella Courington, The Eighth Phrase by LB Williams, Skeleton Keys by Laura Garrison, Vein of Stone by Sarah McCartt-Jackson, l’appel du vide by Christina Cook, Bodies in Water by P. Andrew Miller. Alex Stoli’s Into the Land of Nod is forthcoming in 2015. The press’s website notes, “There are 5-6 spots remaining in the 2015 season. Our reading period opens in January.” What are your hopes for 2015 and beyond? We meant to take five chapbooks in our first season, and ended up struggling to narrow it down to fifteen, let alone the seven we eventually accepted & printed. There are so many poets and writers with luscious words to share, and it nearly drove us mad choosing (which is a blessing, thanks!). It’s a dialogue, of course, and it’s an honor to boost the signal for our creative. There’s something brilliant in each of the books we chose, something arresting, something that said take me home and read me again and again. It’s our hope, moving forward, that we get to 1) print a first-timer every year, 2) say yes to at least five proposals per year, and 3) inspire a few people think the words: holy crap. And promptly revive/continue/take up a chapbook addiction. I suppose you could say we’d like to be someone’s gateway drug to a more open, hungry mind. One day we might like to publish a few full length collections, and offer monetary compensation in addition to our payment in copies. We’d like to try some letterpress small editions. We’re working on some anthologies in collaboration with the staff of Sugared Water, and are open to other sorts of projects in collaboration with artisans. We’d love to put some poetry/micro fictions on art objects. AWP is on our tabling to-do list. One of these days, we’ll get around to mailing author copies zipped up in the belly of a handmade felt pigasus. This all boils down to a desire to brighten and enrich the lives&mailboxes we touch. Life’s too short for anything less. I know you have two chaps coming out—one that is a collaborative chap with three other lady-poets (in these cups) due out soon and another solo endeavor (Deep in Flesh), scheduled for some time in later 2015. Talk about your forthcoming chapbooks. in these cups is a chapbook of poems (some written together, and some of our own in the same vein too) by poets Nicci Mechler, Hilda Weaver, Wendy Creekmore, and Kristin Koester. We write as Wild Soft, and have some work in mags like Stone Telling, Wild Quarterly, Room, and will soon have a few poems in Still: The Journal. Our work tends to be very much about place and experience, melding pastoral with magic realism, and the sassy, assertive feminine. Our ages span five decades, and we fall at various points along the sexual spectrum, and we grew up in different places, so it makes for some memorable retreat & poetry writing sessions—the bourbon helps. It’s really about exploration and collaboration in a fearless place. More often than not, we compose these poems in person, around the kitchen table, on retreat at retreat space managed by the Kentucky Foundation for Women. Deep in Flesh is my chapbook of poetry, also forthcoming from dancing girl press (2015). Most of the poems are rooted in the body, often the damaged body—be it a broken wrist or what’s left carved into the flesh after birth or opening the ribcage. There seem to be a lot of body-pieces and bones, eating and sewing in these—damaging and pulling back together the metaphorical and literal flesh—desire and loss and desire again. How do you define chapbook? A chapbook is a collection of works (short or micro), in any genre, of up to about four dozen pages worth of content. Most of the chapbooks that I own hover between 15 – 30 pages. The covers may or may not be paper—I can’t even say it has to be a book. I’ve been thinking about attempting small edition sculptural displays for chaps, but I’m still waiting for the right manuscript. What is inspiring you these days? Vintage sideshow photos & illos, fables, hauntings, and misty afternoons in the hills of Kentucky, and plant lore. If we’re talking books (aside from everything I’m reading in the slushpile for Porkbelly Press & Sugared Water), I’m currently reading Teahouse of the Almighty by Patricia Smith, one poem a day instead of blazing through them like I usually do. A friend just suggested Seam by Tarfia Faizullah, so that’s next. How are you trying to get better as a poet? I read—a lot (everything). And I do a lot of thinking about poetry as a teacher as well as poet. I just found a 1992 copy of The Practice of Poetry, and I’m starting with the exercises by Deborah Digges and Rita Dove. I like to think this stuff helps me improve. I’m constantly trying to write a long poem, and fail at it every time. Every failure makes me a little better. I ask questions. It’s probably very annoying to my friends. What makes a good chapbook? The same thing that makes a good poem or micro fiction or lyric essay—evocative language, command of craft, lines that seem to go together, pieces that talk to each other. A chapbook should feel like an investigation or way through. I like books that have a point of view, teach me something, deepen my understanding—poems or stories I wish I’d written. What’s next for you? There’s an urban fantasy (novel) manuscript I’m working on—it’s a snarly beast, but we’re coming to terms. I’ve been toying with a couple of chapbook ideas, and am circulating a second collaborative manuscript called how wild & soft you are. & micro chapbooks: Midnight Blue (Vanessa Jimenez Gabb, poetry), Tiny House (Melanie Faith, poetry), Strangest Sea (Ariana Den Bleyker, prose poetry), Mouth of the Rat, (rob mclennen, poetry), and press yourself against a mirror (Janelle Adsit, poetry). Number of chapbooks you own: 50+ chapbooks, but I sometimes give them away. They’re stored with my zines (hundreds). There can be a very fine line between chapbook and zine. Number of chapbooks you’ve read: I couldn’t begin to say how many I’ve read—most were in progress by poet-friends or grad students preparing them for submission to various small presses. I’m always delighted to find beautiful chaps, and mail order as many as I can. We don’t want to talk about what happened the last time I went to AWP. In 2014, I read around 300 chapbook & micro chapbook manuscripts for Porkbelly Press. It’s such a gift to read brand new work—work that no one’s published yet. I love it when I get one and find out it’s a first manuscript and I’m thinking why doesn’t everyone know who you are? I imagine that’s how some people feel about really great shoes. Ways you promote and serve other chapbook poets: I buy chapbooks when I’m able, share calls for submission, sales, and articles about/by small presses, tweet or link when I read an interesting excerpt, and talk to my students about chaps when I’m teaching, ask everyone which book they last loved. If they won’t lend it to me, I see if I can find a remaindered library copy (love the stamps & stickers). I’ve written a few reviews, and might start posting them to the press blog, or soliciting other reviewers, but will first finish aforementioned novel. Where you spend your chapbook earnings: Etsy paper sellers, local art supply stores, and Epson partake in the earnings from the press. That’s another way of saying everything goes back into the press (supplies, postage, promo materials, Duotrope & Submittable fees, etc.). I buy a chapbook or collection of poetry every time I get a big order. Your chapbook wish: I’d love to read manuscripts rooted in culture, identity, language, and tradition—specific experience written in a way that drags me right into that space. I read two poems from Christina Cooke’s l’appel du vide and knew I was going to say yes, I want to publish this, yes. I want chapbooks that make me say yes before I’ve even gotten to the last page. Chapbook Bio: Nicci Mechler (MA English & BFA Studio Art, Northern Kentucky University) splits her time between writing, bookbinding, and drawing girls with inky tattoos. Her work has appeared in such magazines as Arroyo Literary Review, The Pinch, Roanoke Review, Stone Telling, and Kestrel. She edits the lit. mag. 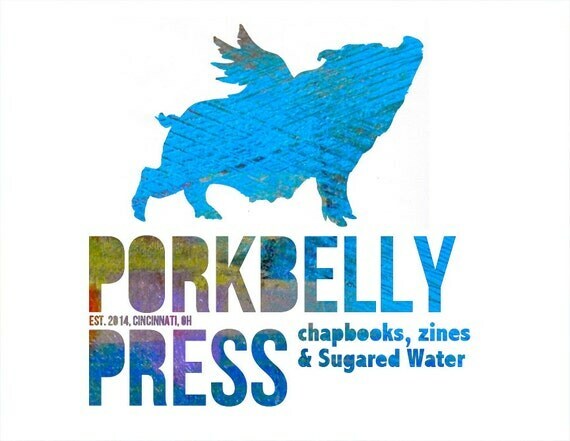 Sugared Water, and established Porkbelly Press in 2014 (small press, chapbooks & zines). She lives in Cincinnati, Ohio with a cadre of rescue animals and delightful people specializing in troublemaking & joy. Nicci blogs at damnredshoes.wordpress.com.